Sharks get a bad press, a very bad press. More people each year are killed by dogs in the United States alone than are killed by sharks worldwide. So why do these highly evolved creatures evoke such feelings of dread and fear? The classic view is often of a solitary hunter ranging the ocean in search of prey. In fact many are highly social and remain in large schools, and live mostly sedentary existences at the lowest level of a body of water. They are found in all seas and oceans, most are carnivorous being cooperative feeders that hunt in packs to herd and capture elusive prey. Their skeletons are made of cartilage and connective tissue – which is very flexible and durable – to reduce weight and save energy. Most sharks also need to swim constantly in order to breathe, they have highly developed olfactory senses and can detect 1-part per million of blood in seawater and a keen ability to determine the direction of a given scent based on the timing of scent detection in each nostril. I have come across sharks in many parts of the world, from huge plankton-eating Basking and Whale Sharks to fast moving white-tip sharks during drop-off dives in the Pacific Ocean. Their appearance is always a reminder of how vulnerable and cumbersome we humans are in the water, especially if weighed down with scuba gear. Until recently all my shark sightings had been from a comfortable distance or of non-carniverous sharks. And that has always been fine with me. 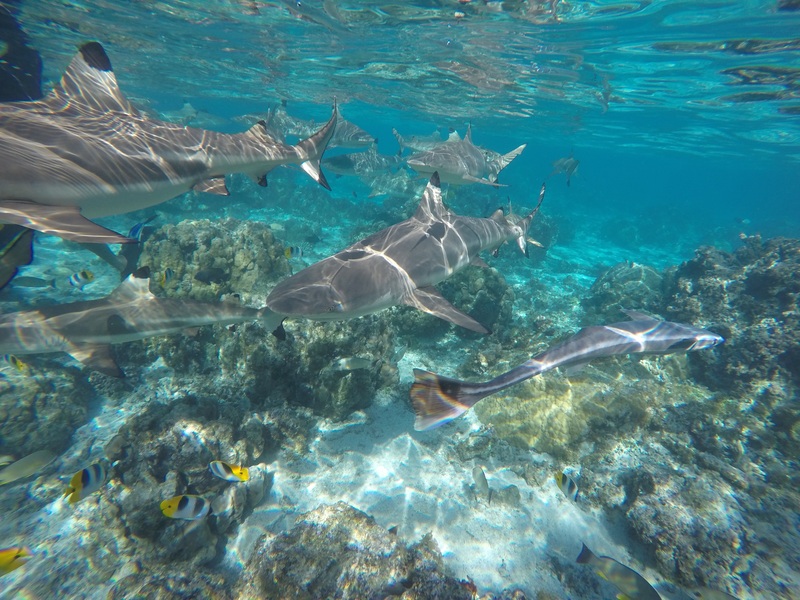 So, it was something of a challenge to learn that whilst on a forthcoming snorkelling tour we would be able to get into the water with some small ‘semi-domesticated’ Blacktip sharks. The day dawned and we arrived at the spot, marked with a buoy and a square of thick rope held in place by corner anchors. The water was only 5-foot deep but crystal clear and from above the water seemed to be packed with sharks all moving in that casually effortless way that 100-million years of marine evolution have rendered to perfection. I spat in my mask and moved to the edge of the boat. Our pilot, Albert, was already in the water with a large bucket and another of our group was on the ladder and descending. There was a clear area near the prow of the boat so I decided to drop in from there. My first sight as the bubbles cleared was of a marine environment completely dominated by sharks. I rotated slowly and noted that although the greatest number were around our pilot they were out there in every region of the immediate vicinity. I realised that I had been holding my breath and started to breathe steadily again. Grace dropped in beside me and I saw her scan the area all round her. We ok’ed each other and moved up to the roped area where Albert was carefully dishing out pieces of fish. Nearer the rope the sharks would come very close to us but never so close that we could touch them, even had we wanted to. They ranged in size from 1-metre to about 1.8-metres but with the magnification from the masks they appeared larger. Grace and I grew a little bolder and swam off away from the square into quieter waters: fewer sharks but somehow more edgy. There were less people here too and the not entirely irrational thought did occur that if one of them did decide to make a lunge then we were the only two morsels available. In spite of this thought I found myself oddly fascinated by being so close to so many sharks. They move so beautifully in water, perhaps only 4mph when cruising, but it has a unique grace tinged with that aura of predatory menace. They often seemed to come straight for you only to pull away at the last minute. This I later learnt is because their fins do not allow them to move in the tail-first direction and so they can only drift away from objects directly in front of them. But it is still something to be staring head on at the business end of a shark, even a small one. We returned to the rope square and watched the slow perambulation until we were shocked to witness a sudden frenzy of motion as the water heaved with fast moving sharks, a blur of bubbles and sleek thrashing bodies. It was over almost as soon as it had begun and we realised that Albert must have emptied the remainder of his bucket into the centre of the square as a grand finale. A heads up on that would have been useful! A week later we were back in a diving boat and in much deeper water. We had been in the water a lot and were feeling very at ease with all things aquatic. Sharks were on the agenda again today but this was feted as a much more realistic encounter. Grace and I dropped off the side and adjusted to the scene. Now the water dropped off below us to about 40-feet and away to our periphery a blue void of incredibly clear water surrounded us. And out in the void slivers of silvery grey reflected the tropical sunlight as they snaked towards us in the lazy slow-tailed glide of the reef cruiser. Some were solitary crusiers while others swam in small packs, several had a small coterie of pilot fish moving in unison beneath them. There was no seabed or rope square here, just a lot more water and a lot of sharks, bigger sharks. They were mostly Blacktip sharks again but were now more in the 1.4-metre to 2.2 -metre range. Now they were below us too and I noticed that I was avoiding making any splashing at all as I swam on the surface. Grace and I swam together for the most part. Once I swam away and turning round to look for her stared straight into the tiny implacable yellow-flecked eyes of an inquisitive shark. Close up it was like a beautiful steel torpedoes of muscle. It veered away as they always did but I felt that my pulse had picked up a beat or two. I rejoined the group of 8, some of whom were free-diving down to take photos with their GoPros. I waited my moment and taking several good lungfuls of air went quickly down to about 20-feet below the surface. If being on the surface had been exciting then being down with them was electrifying. I looked up at all the gently stroking legs and arms, the sharks’ eye-view. On looking down again I was transfixed by a newcomer to the arena. A 2.5-metre Lemon shark was cruising along the bottom and did have a different look to it, bulked up and somehow sharper, keener. I froze. Well to be more precise, I remained as absolutely still as it was possible for a positively buoyant body in water to do. It moved silently away into deeper water and I rose soft as a bubble to the surface to rejoin the other arms and legs. Back in the boat I assessed my feelings on the recent encounter. There had been a mild low-level fear at times – not wholly irrational I thought – plus a sense of fascination and wonder. Being isolated from the group, on the edge of the potential human ‘foodball’, had left me feeling vulnerable but also weirdly elated. I had never felt that the sharks behaviour was threatening in any way, there was never a full ‘threat display’ with body hunching or exaggerated swimming style. Being in clear water and just in trunks I knew also to be safe as sharks don’t attack what they know not to be prey (wet-suited surfers in murky water are often mistaken for seals by sharks who take an exploratory bite and then retreat once they realise their error). I am not sure I would want to venture into the water with the apex predators that include the Great White, Blue, Tiger, Mako and Hammerhead sharks and am content to watch them remotely via a television screen. But I am happy to have dispelled some of the fears we have about them. Sharks are mesmerising creatures that exist in our earth’s waters as pure hunting spirits. 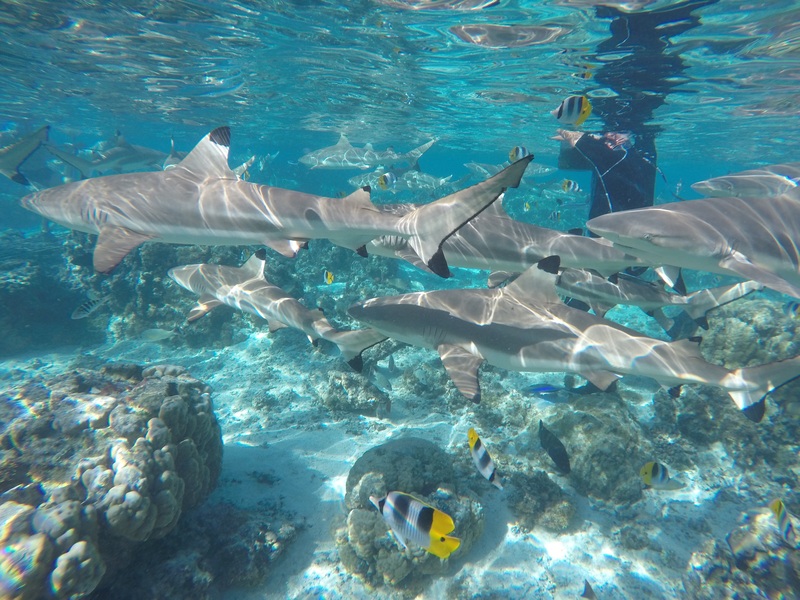 This entry was posted in South Pacific, travel and tagged Blacktip sharks, Great White sharks, Sea Dogs, Sharks, Snorkelling, swimming, swimming with sharks, Tahiti by Ashby's World. Bookmark the permalink.